I am finding more and more wonderful all natural products and so far, a lot have become my staples. 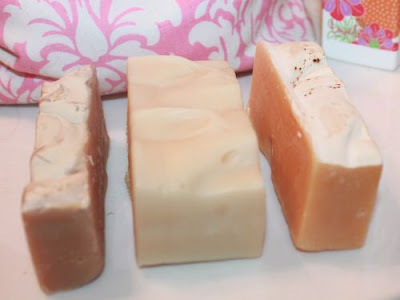 Lately, I have been experimenting with soaps of all different kind of textures, scents and ingredients. There is one in particular that has proven to stand out though, and that is Goats Milk stuff soap. 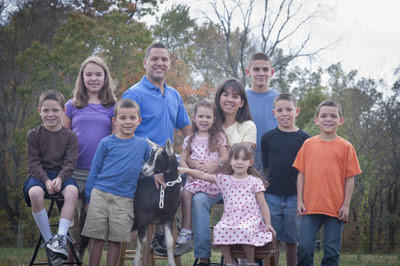 Goats Milk stuff was started by a very driven Jonas family of 10, on a farm with their very own goats! They treat them well, and in return they receive high quality, untainted goats milk, with which to make their wonderful soaps and other fine products. What an entertaining bunch and they are so passionate about what they do as a family and for the all natural community. I received several lovely earth toned samples for review. They sent me 1 full sized soap in Tea tree, which is very generous sized, and two half sized soaps in oatmeal, milk & honey and Almond. Along with 3 small samples in black cherry, love spell, and purity scrub. In addition, I received a lip balm in black cherry. All of the products sans the lip balm, are made with goats milk and came beautifully packaged in their separate Goats Milk Stuff trademark baggies. Before I go into my experience, it's important to note the benefits. Specific soaps are safe for babies, unless they have an allergy specific to ingredients in it and/or the goats milk. Always do a test patch on the arm! Read why Goats Milk is so good for the skin, HERE. Here is a video of their best soaps for Excema. Depending on what yours is caused by, it may help a lot. I chose the Tea Tree in the full bar, because I already knew tea tree was good for ongoing acne, excema, dry skin, and other issues. Some of which, I deal with constantly. It's too early to tell if the Tea tree helped my acne, but I will definitely report back when/if it does. It has gotten rave reviews, so we shall see. Don't rely on me though, READ the testimonials on their site! Take a look at all their videos. They answer a TON of common questions. The scents are wonderful, and not too strong nor light. It engulfs you in the shower and lingers on your skin hours after. Tea tree, Almond and Lovespell have to got to be my favorites of the bunch, but I loved them all. All scents had an element of sweetness that I love. The scent throw was exceptional, but what I found even better was the texture of the top of the full size soap. I don't know if this was done on purpose, but the ripples on it were thick and bumpy enough to make a nice mini massage. It was like a lil spa treatment running it across my neck, shoulders and back. I think they should think about marketing it as one of the benefits. I have spent more on soaps actually claiming to massage and they were pitiful stubs in comparison. That was a great surprise. What impressed me more than anything else was how well this soap moisturized. In fact, I didn't even need lotion when I got out of the shower. Also, and this is no exaggeration, the little bumps on my arms, some people like to call chicken skin? Definitely not nearly as bumpy and dry. I wonder why that is, do I just not moisturize enough or have I not been using the right "medicine" for my skin? I will keep using this soap and see if it helps anymore, but i'm happy to get even some results that I didn't ask for. I've never tried such a nice soap before and will definitely keep repurchasing. At $6.00 a pop for 4.5 to 5.5 oz's, that really is nothing to complain about. The size you get and the quality is worth it. 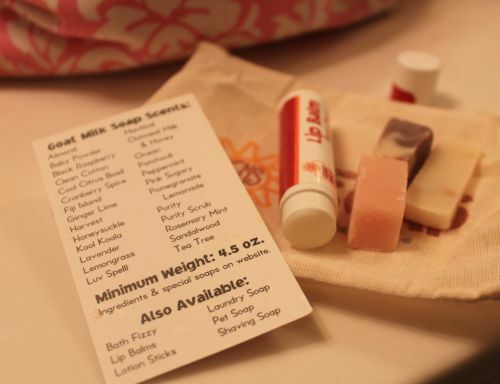 I have seen many soaps that cost as much, with less delivery. I'd say it's comparable to soaps like Dove, regarding only moisturizing capability, but without all the harmful chemicals. Lastly, the lip balm. I am a self proclaimed lip balm addict and judging how the soap was, I knew to expect just as good from this. It turned out lovely, with a very emollient finish and an ever seducing black cherry scent. It lasted throughout the whole day and my lips stayed ultra moisturized. It's also tasteless, the way many prefer it. The lip balm does NOT contain goats milk, as that would require unhealthy preservatives to keep it from going bad and collecting bacteria. Something the Goats Milk staff doesn't believe in using. It is a nice lip balm that will keep a special place in my growing collection. Did I mention that they sent this within two shakes of a goats tail? The fastest shipping this side of product reviewville. That alone made me happy and shows how dedicated they are to making their customers happy. I can't say enough about this company, but I can let them speak for themselves on their cute videos at their website.You have to check them out, especially the opinions from the kids. Too adorable. I guarantee giggles and aww's galore! I have good things about Goat milk products! I want to try out the soap so bad! I have HEARD** good thinks about goat milk products. I just got some really recently as well and their shipping is remarkably fast! Love the lovespell! the lovespell smells so good. I really need to order a full bar soon! WOW! I love companies that have fast shipping, it really shows that they appreciate their customers! We only use real soap in our home, so this company would totally fit in and I love all the options they have! Thank you for sharing. This seriously looks AMAZING! I would love to give it alll a try! Thank you so much for the review! Can't go wrong with products made from a goat! Good review. I love Goats Milk Stuff. Their soaps are excellent. Great review. 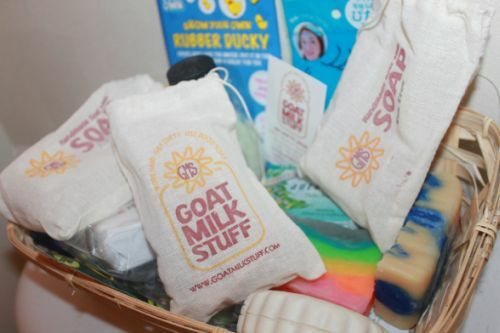 I have heard so many great things about using products made with goats milk. I battle with eczema and I see that it is great for that. I will have to check this out. Thanks. That looks WONDERFUL! I would love anything up there but as a lip balm fiend myself I know what I would try first!! Excellent review! I cannot wait to try this! I have heard such wonderful things! I'd love to see if it helped with my blemishes! Thanks for sharing! I haven't tried these products but they sound wonderful! Maybe I will get some for Christmas! I swear that soap is like artwork!! What a nice family with a great product! Thank you for the review! !